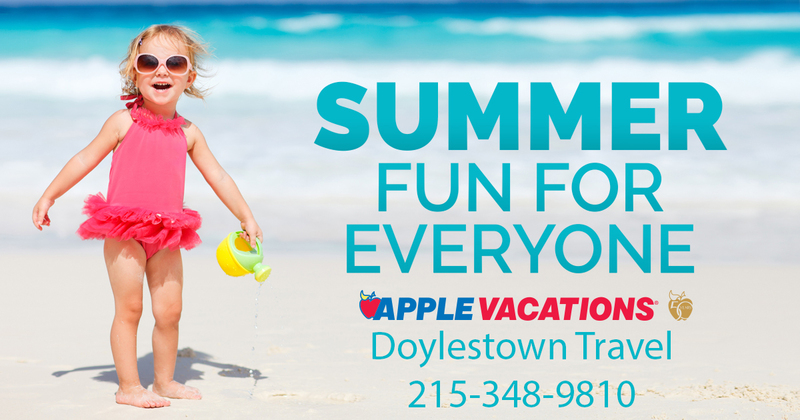 Comments Off on Summer Fun for Everyone Doylestown Travel #1 Deals of the Summer. Apple Vacations starts Summer Sale this weekend ! What are we all waiting for ? Well two or three times a year Apple Vacations and Doylestown Travel pull out all the stops with the Annual Summer Sale. You can go through the list for you as a family or an vacation for two to your favorite resort. Apple Vacations Summer Sale Starts Today. Call Doylestown Travel for your next vacation to help with the best advice at the best price. Be sure to ask about the newest resorts before it is too late. Many of the flights and the resort room will sell out as we will sell everything as fast as we can. Doylestown Travel will offer additional discounts to our clients. So why book and pay more elsewhere.